OXFORD, Miss. – Three School of Pharmacy faculty at the University of Mississippi have been recognized by the pharmacy academy of the National Academies of Practice. 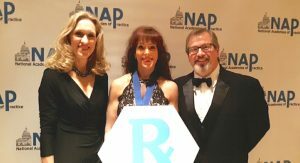 NAP is an organization that seeks to advance health care by fostering collaboration and advocating for policies that act in the best interest of individuals and communities through interprofessional collaboration, education and clinical practice. The group recognized the UM professors at its annual meeting March 7-9 in Pentagon City, Virginia. Seena Haines, chair of the school’s Department of Pharmacy Practice, assumed her role as vice president for programming for the 2019-21 term at the meeting. John Bentley, chair of the Department of Pharmacy Administration, and Kim Adcock, professor of pharmacy practice and director of faculty and academic affairs on the School of Pharmacy’s Jackson campus, both were inducted into the academies’ 2019 class of fellows. In her new role, Haines will oversee the programming committee, which addresses the educational needs of the organization and its members. Haines said throughout her term, she hopes to achieve strategic plan goals, engage current members and attract new members. Haines also was honored as a fellow of NAP in 2018. Bentley called it “a distinct honor” to be recognized as a fellow. Adcock, who was nominated by Haines, has focused her career on improving patient care through interprofessional education, practice and scholarly collaboration, which is a central goal of NAP. “Modeling the core competencies of interprofessional education and practice has always been an overarching goal of my practice, from engaging students in the fundamentals of interprofessional practice to receiving grant funding to incorporate pharmacists in the cystic fibrosis health care team,” Adcock said. David D. Allen, Ole Miss pharmacy dean, praised the three faculty members as dedicated educators and practitioners.